This is a slightly different version of this. I did not layer the ingredients in the container as suggested in the original recipe. 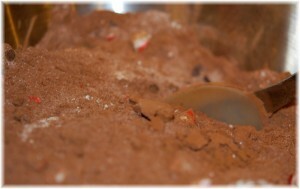 I tried that the first time, but I found that to be a little messy, and it also seemed to me that, although it looked really pretty, it was going to be a little difficult when the person was trying to scoop it out to make cocoa. Instead I mixed it in a large bowl. When I made this the first time, I used all semi sweet chocolate chips because it calls for mini chocolate chips, and thats all I could find the minis in. But I wanted milk chocolate, so I used half and half this time, and just chopped them up. A little work yes, but I think it turned out great! I did make a little mess, but a chocolate mess is never really that big of a deal. I chopped it with a knife, but you might be able to chop it with a food chopper. I think a blender might make a mess of it, but if you give it a whirl and it works, let me know. 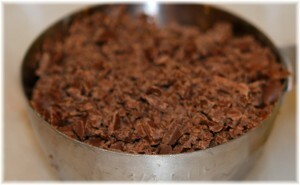 Also, if anyone knows of a source of mini milk chocolate chips, let me know. I couldn’t find any, and I don’t know why no one seems to sell them. I know dark chocolate is supposed to be the thing, but I really REALLY like milk chocolate. 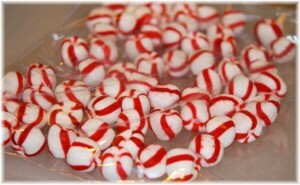 The next thing was the peppermint candy. 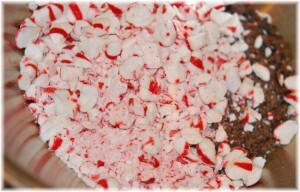 When I made it the first time it was Christmas time and I used candy canes which were plentiful. 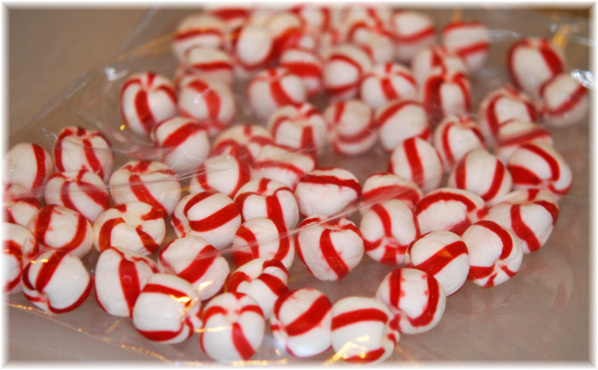 But this time, it was not candy cane season, of course, and I looked at the regular peppermints, but also I looked at the other melt in your mouth kind of peppermints and thought….hmmm, THOSE might be better! 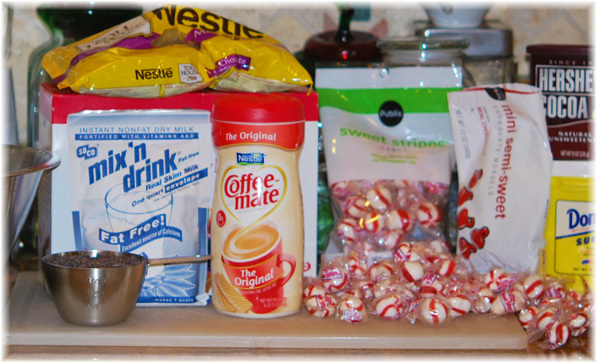 Besides, they had fewer ingredients, basically just sugar and peppermint oil. So, I went with those. I thought they would be really easy to crush. HA! These things are hard like diamonds! Then, mix them in with your chocolate chips, cocoa powder, sugar, powdered milk, and Coffee Mate. 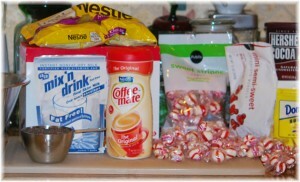 I add the Coffee Mate because it makes it creamier and richer. If you are watching calories you can leave it out, but if I leave it out I will probably end up putting cream in it when I make it anyway. You can use another brand, but I like Coffee Mate best. BTW I also don’t add the salt. I’m not really sure what the purpose is, and years ago I stopped adding salt to most things unless there was a good reason to add it. I’m not against salt, and I like things salty, but my husband and I usually disagree on how much salt things should have, so it’s easier if I just let everyone salt most things at the table. I couldn’t decide why hot chocolate needed salt. If you want to add the salt from the original recipe, go ahead. I don’t miss it in this. Mix all the ingredients really well. This will take awhile, but you will not want to have clumps. 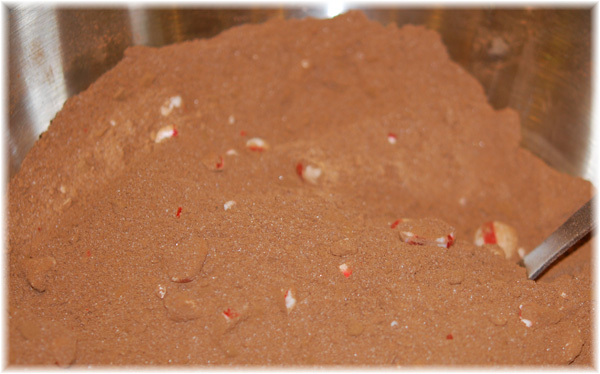 Just keep mixing until it’s smooth, except for the chunks of peppermint candy, which of course will be lumpy throughout the mixture. I think this might also be good with white chocolate chips, or red hot candies or other things I haven’t thought of yet. I think you could probably let your imagination run wild with this. It’s kind of hard to imagine what’s not good with chocolate. I wonder if anyone makes marshmallow chips? Hmmmm. At this point, you will need to have your containers ready. I found cute little glass jars with rubber stoppered lids at the grocery store, but you could reuse glass jars or plastic tubs even. 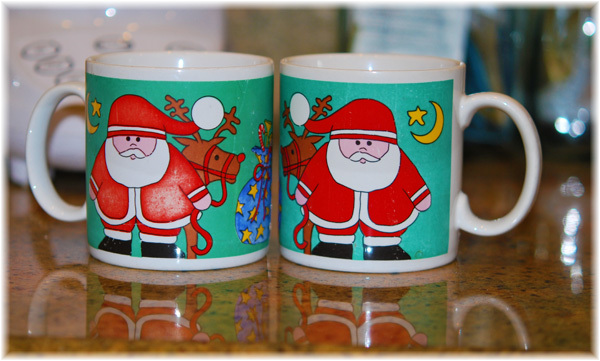 Or cute mugs. Heck, ziplocks would work. What did we ever do before ziplocks? I’m actually old enough to recall life before ziplocks. It was a brutal time. 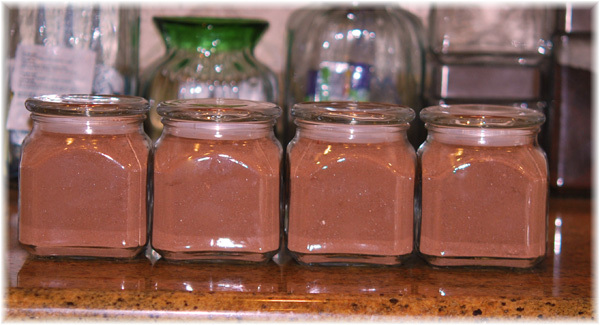 OK, so now you should have about 16 or so cups of powder to put into containers. Keep that in mind when deciding what you’re going to put that into. (or cut this in half or whatever if you have fewer containers). 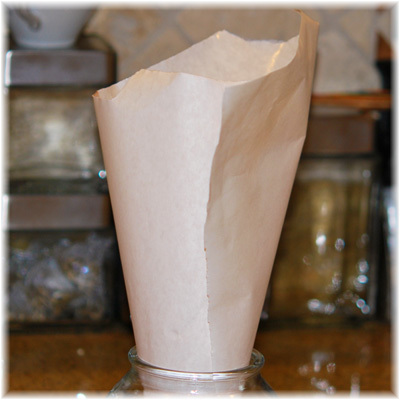 If you don’t have a nice widemouth funnel you can make a quick one with a piece of butcher paper (or wax paper, parchment paper or any sort of heavy paper). This works well and then you can throw it out when you’re done. 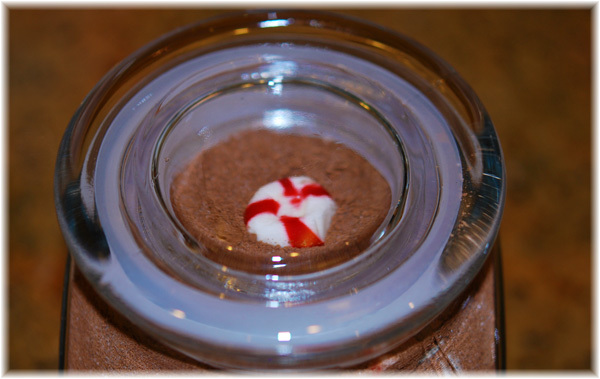 Just make a funnel shape and pour your mix into your jar. Fill your jars nearly to the top. Leave a little room, so you can get your lids on. Then, put one whole candy on the top of each before you put the lid on. It’s nice if you have a glass lid on your container, but even if you don’t, it’s still nice when your recipient opens the top and sees that pretty candy. This looks really nice, and tastes even better. 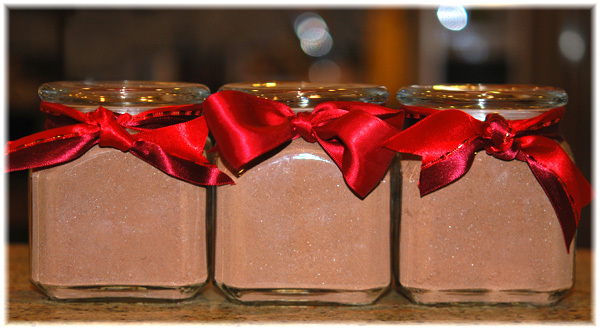 You can decorate the gifts with a ribbon or if you’re really creative you can paint the jars. I will dig out the photos of the ones I did for Christmas and post them, they came out really nice, I have to admit. I’m not going to go to that much trouble for these, since they are just for because. OK, maybe I’ll dig up some ribbon before I pack them up to mail. But that’s all. This made four containers, (16 cups) of mix, and I had a little left over, so I can refill mine once. 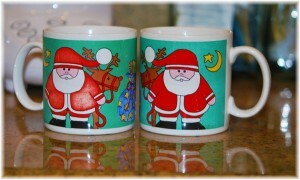 And I had enough for Jeff and I to enjoy a cup this afternoon, for all of our hard work. If anyone tries this with a different twist I would really like to hear about it. We have almost a year before Christmas rolls around again, but judging from the reviews I got this year, I think I will probably do this as a gift again. And new flavors would be great! oh yum, this sounds excellent! 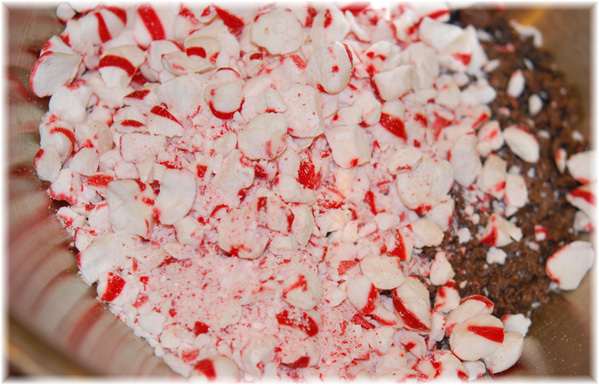 I use powdered sugar instead of granulated sugar, but have not tried the peppermint in it, I will have to try this recipe!!! You are right, chocolate is YUM in any shape, form or fashion!!! I thought about powdered sugar too, because it would dissolve easier. But, when I made it originally, I made it like it was written, and the granulated sugar dissolves with no problem. So, I think either way would work. If you try it with a different twist, please post! OMG, it seems yummmmmmmmmmmmy ! I don’t know how to suscribe on your blog 🙁 I’m trying again lol !